This is a continuation of 20. 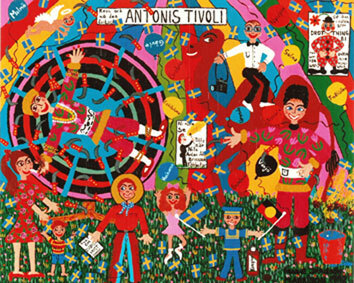 Antonis Tivoli so if you missed it you may want to recap. 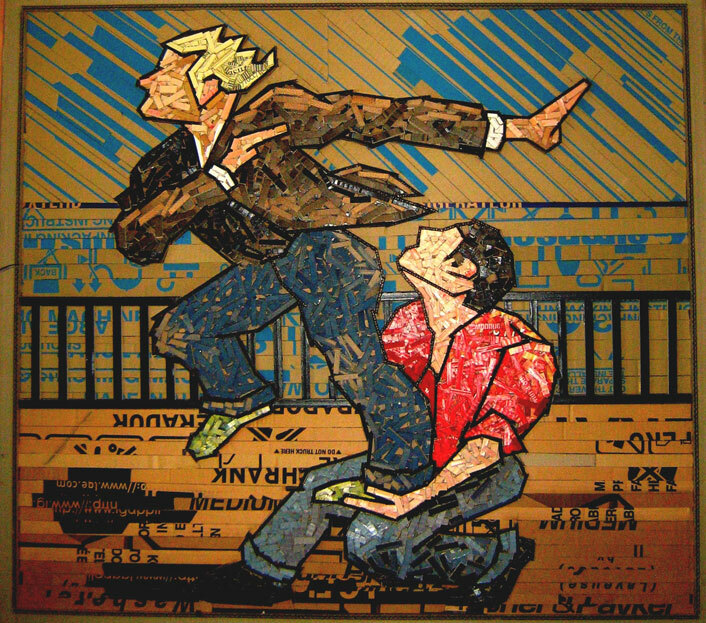 This particular work “The Acrobat” is one of my dads, Ted Jonsson and made entirely from cardboard which he has cut up and painted and glued like a mosaic effect and as you read on you will soon discover how he became an artist. 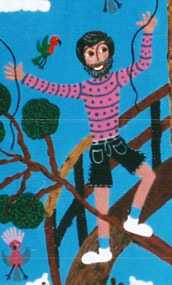 This artwork of my fathers was no doubt was inspired by my grandfathers early career as an acrobat. My father did not want to work in showbiz as he wanted to join the” establishment” that he saw around him and not wanting the circus life. So he went out to sea with the merchant navy first and then went to trade school and qualified as a chef, before settling in as a carpenter. During the summer months when my grandparents would take their Tivoli around Sweden we would go and visit them from time to time. During the day we would find my grandfather fishing in some stream (stress release) and at night we would help out with the sideshows and it was all very exciting. I would usually be allowed to pick something out from the prizes in sideshow ally, and that was a big treat. In this painting my grandfather is throwing knifes at my grandmother but he wore many hats and also had the stage name as DEVIS-THE LIVING VOLCANO, eating what appeared to be burning meatballs, this trick he would also do for us kids at family gatherings and me and the cousins just loved it. My knife throwing Grandfather never missed! My Grandfather Anton also appeared as Nilo the comical juggler, dressed as a clown, and juggling to the delight of the watching audience. My aunty Eyvor is the lady with the cigarette and she would do a disappearing act and also a dance with feathers and fans, later on Eyvor and her husband also travelled the country side with their own Tivoli. I have just found out that my cousin Sonja was also left at home alone for months at a time, although she was around 13 years old when that first started. Uncle Willy sitting on the camel did lots of behind the scenes jobs, before being in charge of the lights in several Swedish Theatres and later on worked for one of the TV news channels in Sweden and was part of breaking many exciting news stories. Uncle Charles became a civil engineer and was revered as the one who went to University, and joined the elite so to speak. My father decided after working as a carpenter both in Sweden and in Australia and doing painting and sculpting in his spare time, it was time to bite the bullet and he now dedicates his time to the arts either by helping my brother or me or doing his own fabulous sculptures out of found objects and if you feel like checking out his art go to Ted Jonsson Junk Art on face book or use this link Ted Jonsson Junk Art.